There are many delicious recipes you can make with ground beef. 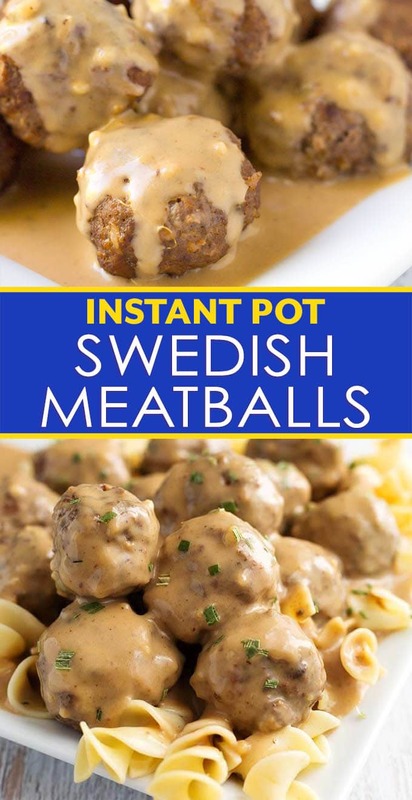 Instant Pot Swedish Meatballs is one of my top 5 favorites. 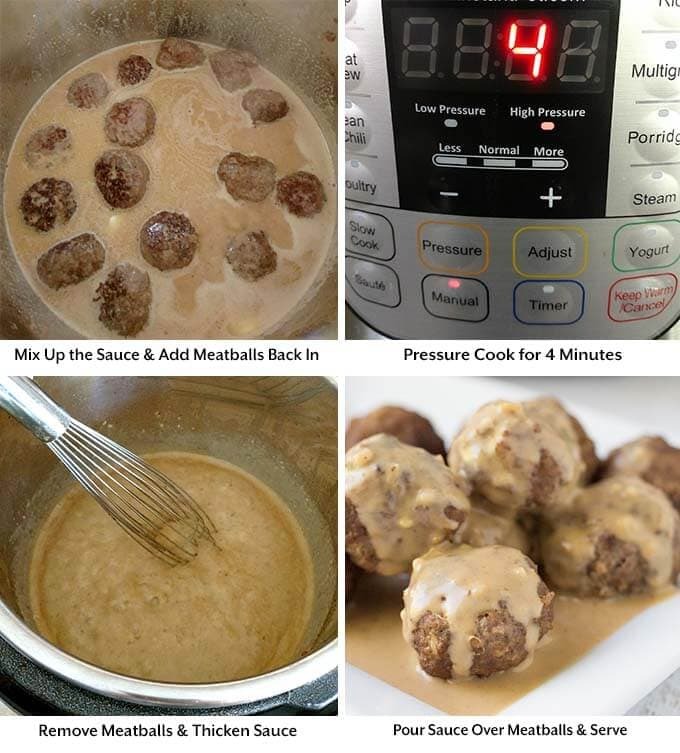 The flavor of these pressure cooker Swedish meatballs is really good, and the rich sauce complements the meatballs very well. 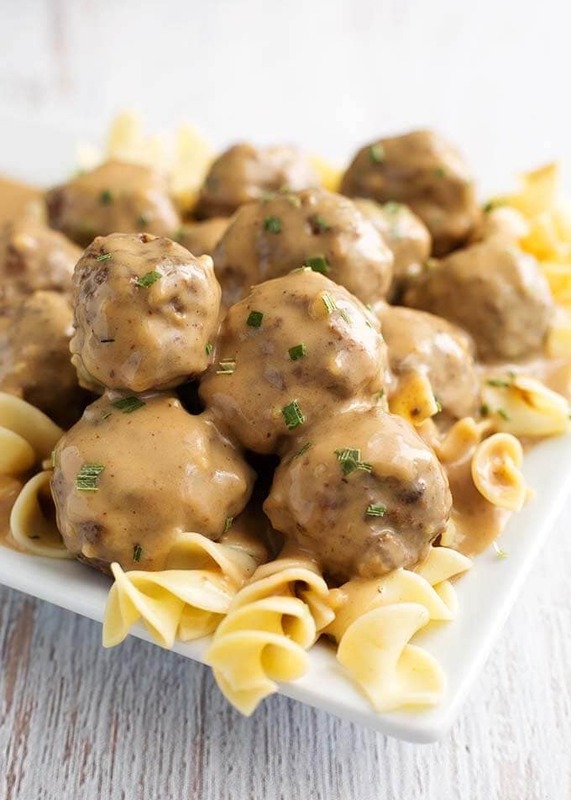 Served over noodles or mashed potatoes, these Swedish Meatballs are amazing! Even though I have Swedish roots, I didn’t find out until I dug into my family history. Finding out about one’s roots feels like completing a puzzle. My obsession for pickled herring, and Swedish meatballs may come from there. Or, I just love them because they are delicious! 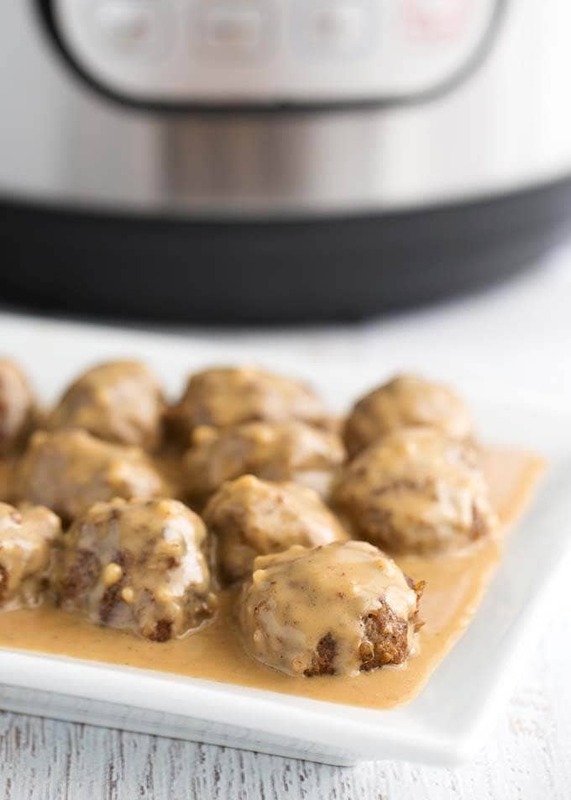 Speaking of delicious, these pressure cooker Swedish Meatballs are very delicious! In this recipe for Instant Pot Swedish Meatballs, I wanted to stay with the traditional ingredients, but strayed a little. You will not typically find Worcestershire or Dijon in the sauce. I didn’t add a lot, but I think the flavor is so much better from the addition of these two ingredients. Lightly browning the meatballs before pressure cooking them gives them, and the sauce, a richer depth of flavor that only something fried/browned can give. 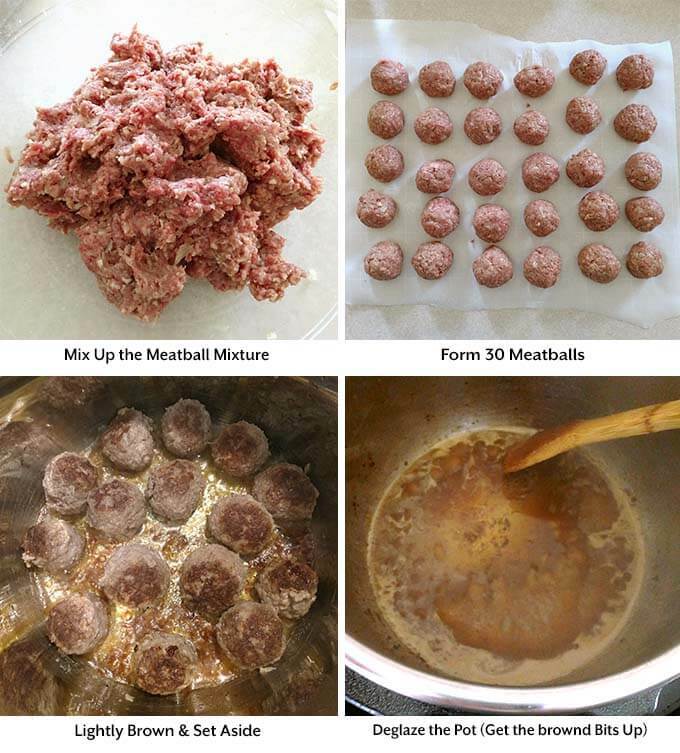 Please don’t skip this step unless you are using frozen meatballs. I hope you won’t be put off by the Allspice and Nutmeg. There isn’t enough to make it taste strongly of those spices. They are warm spices, and just add a little something special, and they are traditional to Swedish Meatballs. Serve Instant Pot Swedish Meatballs alone, or over a pile of egg noodles or mashed potatoes. The sauce/gravy is so good you won’t want to leave a drop of it on your plate! 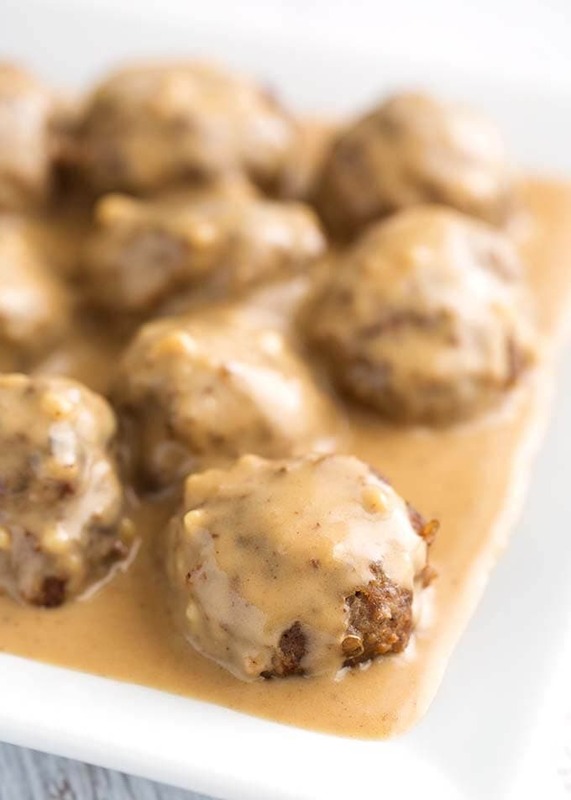 Instant Pot Swedish Meatballs are tender, flavorful meatballs with a delicate flavor. Covered in a rich sauce and served over noodles or mashed potatoes. 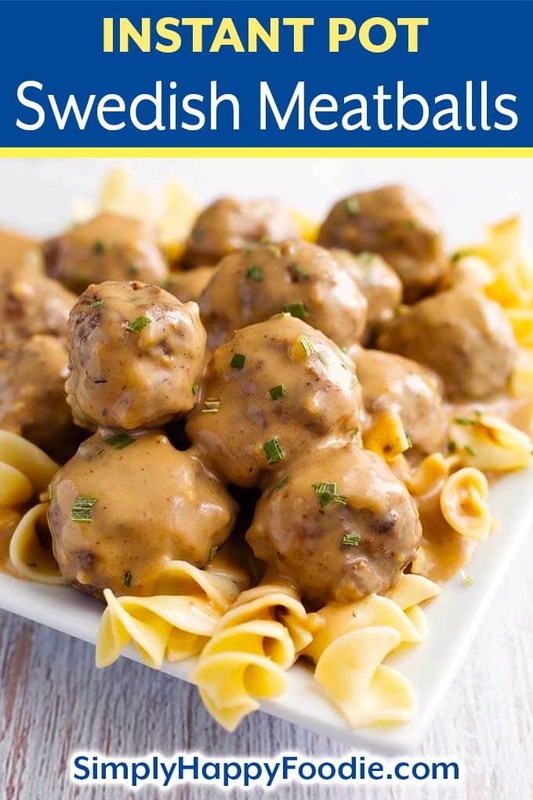 These pressure cooker Swedish Meatballs are a family favorite recipe! In a mixing bowl add ground beef. ground pork, panko, milk (pour over the crumbs), onion, salt, pepper, allspice, nutmeg, garlic powder, beaten egg, and 2 Tbsp of the parsley. Mix together well to combine the ingredients. Form 30 meatballs and set them on parchment paper. Turn on the pot's Sauté setting, and when it is hot, add the olive oil and 2 Tbsp of the butter. Add 15 of the meatballs and brown lightly on outside. Do not cook completely. Remove to a plate and repeat with the second batch. Add the beef consommé and stir, scraping the bottom of the pot to get up any of the browned bits (deglaze). Add the remaining 4 Tbsp of butter, dijon, Worcestershire, and 1 cup of the heavy cream (reserve the remaining 1 cup). Stir well. Add the meatballs back into the pot. Close the lid and set the steam release knob to the Sealing position. Press the Pressure Cook/Manual button or dial (High pressure), and then the + or - button or dial to select 4 minutes. When the cook time is finished, let the pot sit undisturbed for 6 minutes (6 minute natural release). While the meatballs are cooking, mix the flour with the remaining 1 cup of heavy cream. Whisk it well so there are no lumps. Set aside. Do a controlled Quick Release of the pressure (*A controlled quick release means you release the steam in short bursts, then longer bursts, until you can be sure none of the sauce spews out of the vent with the steam from the intense pressure. Then fully open the vent and let it go). When the pin in the lid drops down, you can open it. Remove the meatballs to a plate and cover. Turn on the Sauté setting (Med - Normal temp) and bring to a simmer. Whisk in the flour/cream mixture, stirring frequently, until thickened. Cancel the Sauté setting. Taste the sauce and adjust salt & pepper, if needed. You can either add the meatballs back in, or serve and pour the sauce over them. Garnish with remaining parsley. Instant Pot Swedish Meatballs go great over noodles, rice, or mashed potatoes. Calories are variable based on the ingredients used. Based on 3 meatballs with sauce. We loved these meatballs! The sauce was so good too. We had them over mashed potatoes. Even our picky toddler likes them! Thanks for a great recipe! Yay! It’s so nice when the whole family, picky toddlers included, like the meal you cook! Thank you for your review! In Step 12, do I set is the saute at medium or high? Hi Jennifer. This is one of those recipes that you want the sauce to be rich and thick, and adding water to cook the noodles would thin it. Not to say it can’t be done, but egg noodles cook very quickly. Maybe put the meatballs on the bottom, layer the noodles on top, then pour in the water/broth, and the sauce over the noodles (try to cover them all). You need 1 cup of water/broth for every 4 oz of pasta. Then cook for the 4 minutes and do the controlled Quick Release. I do this method for my Meatball Pasta Dinner, so maybe it will work. Let me know! These were DELICIOUS! Everyone enjoyed them from the pickiest to most adventurous eaters. I was disappointed I was too full for seconds, we’ll be fighting over the leftovers for lunch tomorrow! I’m glad everyone liked these, Marie! Thank you so much for your review! Hi Rachel, I’m glad the visuals worked for you. I try to make them for most of my recipes. Thank you for your review! Yes. I would freez flat in a freezer bag so they are easier to separate while reheating. That’s great, Jessica! I’m happy that you liked this recipe! Thank you for your review! Hubby said “this is a keeper!! !” Only thing I did different ly,I rolled the meatballs in flour before I browned them and I had made then in advance. I didn’t use as uch butter& oil as called for,as about half seemed enough. The meatballs nd the gravy had awesome flavors!! Thanks for sharing!! made these last night for my family and we all loved them! this morning i am still getting compliments on dinner last night. thanks for the recipe i will come back to it over and over again. That’s so great, Abby! Thank you for your review. Can I just use ground beef? I’m worried they won’t have ground pork at my grocery store. Delicious! So easy, my first recipe in my instant pot and my finicky 6 year old loved it! That’s great, Karla! It’s so nice when the little like what you cook! Thank you for your review! I have a box of frozen Angus beef meatballs, how would I use them if I skip the browning step? Add them in after the gravy ingredients and proceed with the rest of the recipe. Hi! I would like to try this recipe, but I can’t eat pork. What would recommend for the meatballs? Thank you! You can use ground beef or ground turkey. Can I use one pound each of ground meat and ground pork while increasing spices slightly? Yes, if more meatballs is what you are going for, just double the meatball mixture. How would you reduce this recipe for a 3qt instant pot? What would you use instead of heavy cream to reduce the fat content? You can try cutting in half and using half and half instead of heavy cream. If you want to make the full recipe, it will fit in the 3 qt. Do I double the time if i am doubling the ingredients? No, keep the time the same. Oh my GOODNESS were these good! 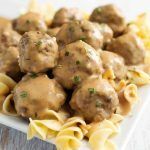 I had a go-to Swedish Meatball recipe before, but thought I would try this using our Instant Pot. So glad I did! Easy recipes, directions were spot-on, and it was a hit with the whole family. The only thing I did differently was use ground turkey instead of pork, because the grocery store was out of pork. The meatballs were perfect, and the sauce was divine. Served over egg noodles found in the freezer section and peas. Thank you for the great recipe! That’s awesome, Alicia! I’m so happy you liked this recipe! Thank you for your review! If using frozen meatballs would I just add everything but the slurry ingredients and cook for 4 minutes? I happen to have a bag of frozen ones I want to use up instead of going out and buying some meat. Yes, just take it from the step after browning them. This recipe is by far one of the best meals I have had in a long time. Thank you for sharing. This was excellent! We had it with mashed potatoes and Lingonberry sauce, so good! Lingonberry sauce is so good! I’m glad you liked the meatballs! Do you think you could do this in a crockpot? I bet the flavors would be richer! Yes, just brown the meatballs on the stove, and then add them to the crock and cook for 4-5 hours on Low or 2-3 on High. Absolutely amazing recipe!!!! So good!! Will definitely use agaian and again and again!! Great! Thank you, Daniel! I appreciate your feedback.